Mostly this is just Yahweh crowing again about his power and glory. 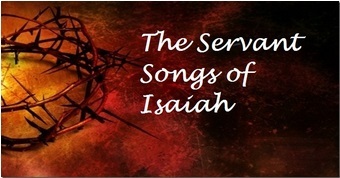 However, it is also the first of 4 “Songs of the Suffering Servant”. These are four poems in Isaiah written about a certain “servant of YHWH.” God calls the servant to lead the nations, but the servant is horribly abused. The servant sacrifices himself, accepting the punishment due to others. In the end, he is rewarded. Who is this suffering servant? Traditional Jewish interpretation is that the servant is a metaphor for the Jewish people, although some consider that it is the Messiah. Traditional Christian interpretation is…. Well, you guess. There are some familiar clichés here, e.g. that Israel will be a light to the Gentiles (KJV) or the nations (NLT)(v 6). And in v 10 we get “Sing unto the Lord a new song, and his praise from the end of the earth”, but we covered that back in Psalm 96 so I won’t go into it again here. Just more of god’s boasting about how he engineered Israel’s destruction and subsequent restoration. In some of the verses he sounds like a maniacal James Bond villain or Dr Seuss character – eg v 2 “I have called you by name and you are mine”; v 13 “No one can undo what I have done.”; 18-19 “forget all that— it is nothing compared to what I am going to do. For I am about to do something new.” And then when the people neglect to stroke his ego, he pouts in v 22-23 “You have grown tired of me, O Israel! You have not brought me sheep or goats for burnt offerings.” Boo hoo. Yahweh’s boasts are more than a little extreme, eg v 2 ‘when thou walkest through the fire thou shalt not be burned’. Does anyone take this literally? And interestingly, the NIV keeps this text, but NLT, which leans more to interpretation, treats it as metaphor – “When you walk through the fire of oppression, you will not be burned up”. Then we hear all about god’s favoritism again in v 3-4, as he describes how he chose Israel to be his special people and sacrificed other countries who didn’t quite make it as teacher’s pet. How disgusting. In v 10 and 12 there are references to the people being god’s witnesses, and apparently that’s how Jehovah’s Witnesses got their name. And in v 11 god brags that aside from him there is no saviour – not even Jesus? Or does he mean that he IS Jesus. So confusing. More ego – ““I am the First and the Last; there is no other God. Who is like me?” (v 7). (Now that does sound like something Jesus would say, especially in the gospel of John.) There follows a lengthy rant against idols (v 9-20). And then more self-congratulations yada yada yada. Nauseating.